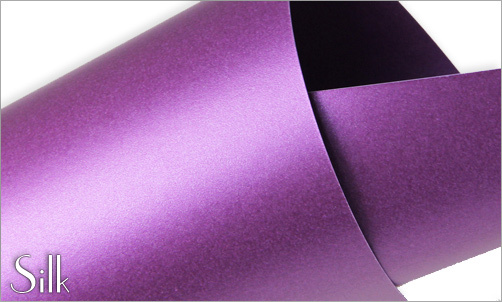 Looking for a nice purple paper for your next project? Well you've come to the right place, because at LCI, we have a plethora of purples for you to choose from! Eight different shades, four different finishes, and one tough decision � which one is right for me? That's where this handy video comes in. To help you decide, we've compiled a quick rundown of all eight shades, organized by finish. See them in action, compare, contrast, then decide! 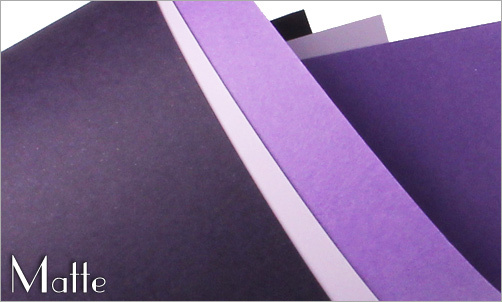 Three of our purple papers have a smooth, matte finish, meaning there is no texture or shine present whatsoever. Two are from the Pop-Tone line, one is from the Gmund Colors line, and all are lovely. Pop-Tone Grapesicle Pop-Tone's grapesicle is a pastel purple � think lilacs and easter eggs. Though it is a soft shade, it has just the right amount of saturation to make it unmistakably purple. Pop-Tone Grape-Jelly As appropriately implied by its name, Pop-Tone's grape jelly is a fun, classic shade of purple reminiscent or grape jelly, candy, or other sweet treats � anything but the actual fruit! Gmund Grape Not to be confused with Grape Jelly, Gmund's Grape is a dark, deeply saturated shade of purple. Some say it's eggplant, some say it's regal � whatever you call it, it's rich, elegant, and classy. Onto the metallics! Two are from the Stardream line, one is from the Curious line, and all have a shimmery, sparkly finish on both sides. Stardream Kunzite A soft, subdued shade of purple, Kunzite is best described as pale lilac. With a slight iridescence, it takes on blatant purple hues in some lights, but white, silvery hues in others � more apparent when placed next to darker purples. Stardream Ruby Don't be fooled by it's name, Stardream Ruby is not a red, but instead an eggplant purple. With undertones of red and brown and a slightly different hue with every turn of the sheet, this shade is truly unique. 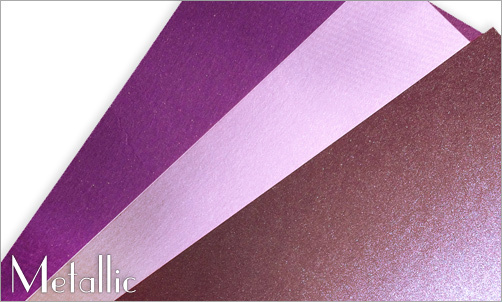 Curious Metallics Violette Another rich, regal looking purple, Curious Violette is deeply saturated and is complemented by a golden sheen. It's truly something and makes for some wow-worthy designs! So. . . Silk Fashion Purple Just as you might guess, So Silk's Fashion Purple is made of real silk fibers, and has a silky smooth iridescent finish. Depending on the light, fashion purple is one of two vibrant, edgy shades of purple. It's different, it's modern, it's very cool. Japanese Linen Violet Last, but not least, we have Japanese Linen in the color Violet. 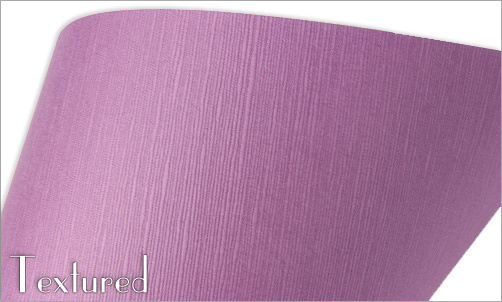 It features a prominent, very distinguished embossed texture, and the color is best described as a mauve. Here they are � all very purple, yet all very different. If you would like to see these papers in person, we recommend ordering samples prior to purchase. 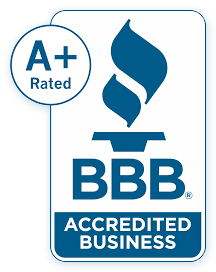 And if you have any questions, please get in touch with us by phone, email, or live chat.